Ireland will have a new leader on the field on Sunday when they open their Friends Provident Trophy campaign against Nottinghamshire at Clontarf. It should be a daunting prospect for a 23-year-old but William Porterfield has been groomed for this role for over a decade. The Gloucestershire opener has skippered Ireland at all age levels from U13 upwards and his apprenticeship finally ends this weekend in Dublin. Porterfield takes over from the experienced Australian Trent Johnston, whose decision to take a break from international cricket led to the left-hander's promotion to the top job. "It's a big honour and priviledge and it is a challenge I'm looking forward to," he said. "I've learnt a lot from Trent - he brought young players through, looked after them and he set an example by how he went about his game and how he prepared on and off the field. "I may be young but I've plenty of experience of captaincy and I love it, being out there right in the mixer. "I was vice-captain under Trent and I filled in when he was off the field so I've had a taste of it. "I'm an open minded captain and while I'll make the final call I will take advice from other players in the team." 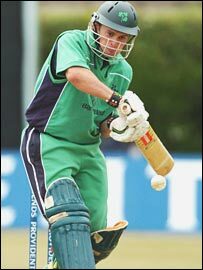 Porterfield played his part in Ireland's World Cup heroics a year ago, hitting 85 runs in the Super 8 victory over Bangladesh in Barbados. However, Bangladesh claimed a measure of revenge with a 3-0 one-day series win over the visiting Irish last month. The games highlighted deficiencies in the Ireland team and they go into the new season without Johnston and retired bowler David Langford-Smith. Coach Phil Simmons, who replaced Adrian Birrell a year ago, has brought youth into the squad as Ireland enter what Simmons describes as a "new era". "We played some good cricket in parts in Bangladesh but we failed to combine good batting, fielding and bowling in the games," added Porterfield. I'm looking forward to captaining the team but getting off to a winning start in the Friends Provident Trophy is the priority. "We bowled well after the first game but we struggled with our batting and didn't string partnerships together. "It is key now that we put strong partnerships together - we don't want players getting 20s, we need them go on to get 60, 70 and centuries. "There are new players coming in but they have quality and Reinhardt Strydom is going to be big player for us in the coming years. "Phil Simmons does things slightly different from Adrian Birrell but the lads have adopted to it very well. "The way he prepares for games is really good, everyone knows their roles and he is big on discipline, which is helping the squad." Porterfield hails from the North West cricketing hotbed of Donemana and he finessed his game playing for the highly successful village club. Four summers with the MCC Young Cricketers gave Porterfield his first experience of full-time cricket and he is now striving to establish himself in the county game with Gloucester after earning a 12-month contract. "Getting into the Gloucestershire first-team will be difficult so all I can do is score runs and put pressure on the top-order batsmen. "But the county are happy for me to go off and play for Ireland to get some experience at the highest level. "I'm looking forward to captaining the team on Sunday but of course getting off to a winning start in the Friends Provident Trophy is the priority. "If we can put a few solid partnerships together we have a chance and I'm confident this team can be successful."